The Aesthetics of Composition in Abstract Painting: Artwork of the month: Yue Minjun's "Untitled"
I love looking at this painting, but i am unable to stare it down for long. Its content reminds me of how the world works for most people, and really laughing through the lies is a disappointing way to live. 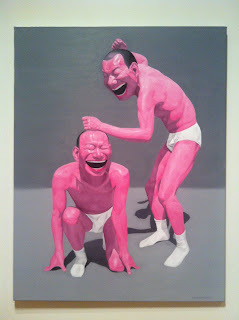 Yue Minjun is a contemporary Chinese artist living in Beijing. His work is obvious in telling us the mental state of his world. He is a cynical realist, and as you can see these men frozen in states of laughter or simply holding that happy smile for presentation, they are anything but laughing. This is a masterwork, if even only for its content. ...go see it, and take some time contemplating the reason they smile.